Real Salt Lake has broken ground on their new stadium in Sandy. 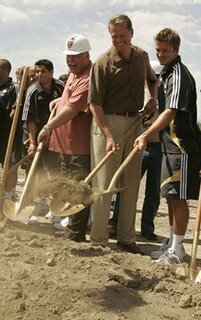 In the photo you can see (left-right) Sandy Mayor Tom Dolan, Real Salt Lake owner Dave Checketts and David Beckham tossing aside the dirt to start the process of building the team a new home (photo from Salt Lake Tribune). Actual construction work will start by the end of the year and should be finished some time in 2008. And to think, someone once said that a Sandy stadium deal was dead. What an idiot. Congratulations to Real Salt Lake and their fans. Hopefully this will allow the side to continue to grow their support as well as bring in more money for the local community. By the way, with this deal and the New York deal, 9 of the 13 MLS clubs (including next year's rookies Toronto FC) have some sort of stadium deal in place or already built. Good news for the MLS and soccer in America. Update of the story here. Don't forget the US Soccer Carnival part IV.